Ron Ringsrud’s Emeralds, A Passionate Guide is an adventure book, one that educates but also entertains. In its 23 chapters it takes you on a captivating journey into the world of emeralds and the people intimately involved in every aspect of this gemstone’s unique journey through civilization—from the mining operations large and small that yield emeralds, to the cutting of rough, through the gem and jewelry marketing pipeline, all the way to the final consumer. This book takes you there in a way that no book has done before. When Ron approached me to write the foreword, I was pleased to do so because we have many similar thoughts on gemology and its place in the gem and jewelry industry. I have known Ron since he began his career at the Gemological Institute of America in California in 1980. 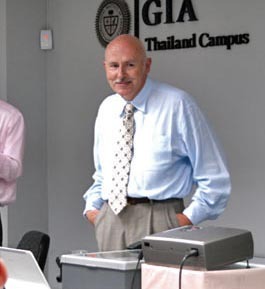 He assisted in developing some of GIA’s gemological instruments and taught neophyte jeweler-gemologists how to use them properly at the point of sale. His passion was always particularly focused on emeralds, so it came as no surprise when he decorated the wall in the instrument sales room with a photo of a classic three-phase inclusion. Besides being a well-known emerald dealer, Ron is a gemologist who approaches his chosen subject scientifically, but also as an artist and humanitarian. He is well known to gemologists around the world for his authorship of several excellent articles and descriptive notes on Colombian emeralds. His contributions to our understanding of emeralds are underscored by articles such as “The Oil Treatment of Emeralds in Bogotá, Colombia” (1983), “The Coscuez Mine: A Major Source of Colombian Emeralds” (1986) and “Gota De Aceite: Nomenclature For The Finest Colombian Emeralds” (2008), all published in GIA’s prestigious Gems & Gemology magazine. Ron’s passion for his subject comes through in every chapter of this book. He takes you to Colombia, South America, and lets you experience what he has experienced during his years of living in the country and exploring every facet of the emerald trade for more than two decades. The journey will also take you to ancient and medieval times and to the 1500s, when the Spanish Empire’s treasure fleets began to send extraordinary shipments of New World emeralds to India’s Mughal dynasty. When it comes to oils, hardened fillers and dyes, Ron knows the importance of recognizing the various means of emerald enhancement. He has written and lectured on the subject many times. With this book, he keeps the enhancement chapter simple but practical, something only an expert on the subject can do. Virtually no “stone” is left unturned, and there are chapters covering almost every aspect of the emerald trade: history, geology, color grading, cutting and of course, the people who have built their lives and livelihoods around this magnificent gem. "The building block of emerald consists of stacked rings of silicon and oxygen atoms, with aluminum and beryllium positioned on the edges. The rings are stacked vertically to form tubes. These tubes are so tiny that only a single molecule of water can fit into the openings, which are only a few angstrom units wide. Up to 2% of an emerald’s weight is water molecules fitting one by one into those tubes. Sinkankas calls this feature “striking” and points out that beryls have the most complete class of symmetry among all hexagonal minerals. "Some scientists say the water molecules can rotate when they are in the tubes, while other scientists say that the fit is so tight that the water can “only oscillate.” The reason I chose to express this fact to you is hard to say. Perhaps I believe that you have an imagination like mine and the thought of those water molecules in the structural tubes of an emerald brings to mind an image of white bunnies, oscillating and twitching, in their tube-like burrows with their noses rubbing against the emerald walls. Perhaps some day the right magician will come along and reach into an emerald and pull one of them out, like pulling a rabbit from a hat." The late Dr. Edward J. Gübelin has had a powerful influence on Ron’s career. Early on, he recognized Dr. Gübelin’s great subjective skills of gemstone appreciation and made them his own. The poetry presented in the back pages of this book emphasizes the author’s abiding passion for emeralds and was greatly enhanced by Edward Gübelin’s collaboration. It is not only a unique presentation for a gemological book, but it also provides a very fitting and thought provoking conclusion. While Ron’s book is meant to be “an introduction to the world of colored stones through the example of emeralds,” and to bring newcomers into the world of emeralds and colored stones, it also has information for the true connoisseur, including descriptions behind terms such as gota de aceite and “old mine” emeralds. Through his long experience, the author feels that emeralds engender more passion than most other colored stones. This book is a true adventure, a work of imagination and creativity, and in that respect it is just like Richard Hughes’ Ruby & Sapphire. It is also a complement to John Sinkankas’ Emerald and Other Beryls, and—most importantly—unlike many gem books, a book that is fun to read.